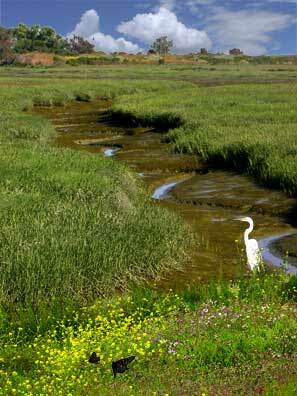 Bayland Birds - Marsh The egret knows tidal waters flow into this ditch twice daily with another feast. Tide, winds and birdlife move constantly in the huge wetlands which fringe San Francisco Bay. A ten minute bicycle ride from Palo Alto brings me for photos this spring and summer of 2003.